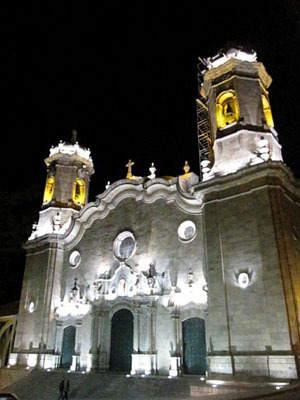 The two huge towers of the Potosi Cathedral cast a magnificent shadow onto the Plaza 10 de Noviembre. In the heat of the afternoon sun, when the Cathedral is conveniently closed, small crowds can be found eating salteñas and other snacks on its shaded steps. 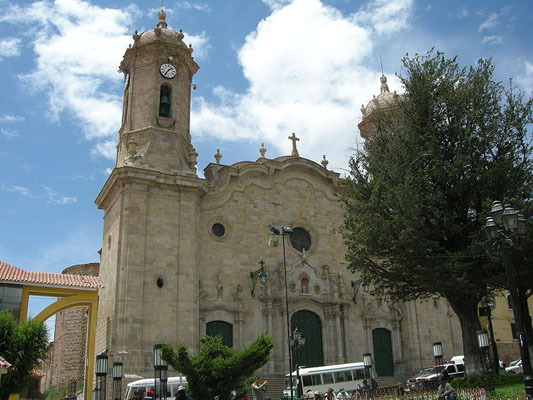 Having begun in the second half of the 16th Century, the Cathedral was completed in the early 1600s. It has since been repaired, taking thirty years (from 1808 to 1838) to complete the process. Among the many the aritifacts contained within the Potosi Cathedral are the wooden medallions of the Assumption and the Coronation of the Virgin. Entrance is by guided tour only. The cost of the tour guide is included in the 15 Bs entrance fee, as are the cost of using a camera or videocamera. Visitors will definitely want to take advantage of this, as the Cathedral is possibly the grandest religious building in Potosi (and not through want of competition).